Laurence Olivier and Merle Oberon wander the moors in Wuthering Heights. The Stars: Merle Oberon, Laurence Olivier, David Niven, and Geraldine Fitzgerald. Source Material: Emily Bronte's 1846 novel. A vintage poster for Wuthering Heights. 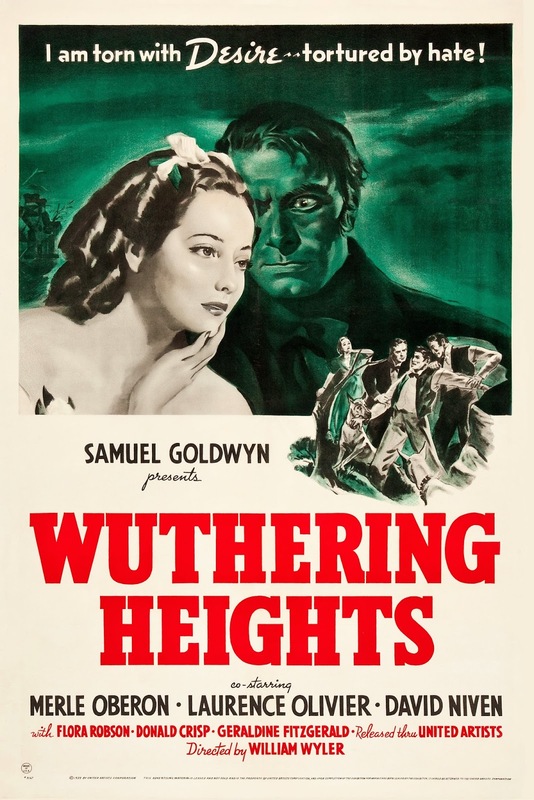 Awards: Wuthering Heights was one of the National Board of Review's Top Ten Films of 1939 and it won the New York Film Critics Circle Award for best picture. Gregg Toland won an Academy Award for best black-and-white cinematography. Wuthering Heights was nominated for seven more Oscars: Best Picture; Best Director; Best Actor for Olivier; Best Supporting Actress for Fitzgerald; Best Screenplay; Best Art Direction and Best Musical Score. The Plot: A traveler (Miles Mander) gets caught in a snowstorm on the lonely Yorkshire moors. He stumbles onto a farmhouse, Wuthering Heights, where he meets its forbidding owner, Heathcliff (Olivier). The traveler spends a restless night at Wuthering Heights, where he sees the ghost of a young woman. Later the traveler hears the story of Heathcliff's doomed love affair with Cathy Earnshaw (Oberon) from a housekeeper (Flora Robson). Backstory: Screenwriters Charles MacArthur and Ben Hecht wrote an adaptation of Emily Bronte's classic novel in 1936. Producer Walter Wanger bought the rights with the intention of making a film starring Charles Boyer and Sylvia Sidney. That project fell through and Wanger shopped the script to every studio in Hollywood. Bette Davis lobbied Warner Brothers to buy the script and MGM almost picked it up, but in the end independent producer Samuel Goldwyn made Wuthering Heights. Director William Wyler was very keen to direct the film, but he had a difficult time convincing the Polish born Goldwyn, who always referred to the film as "Withering" Heights in his fractured English. Goldwyn was quite skeptical about the film because he didn't like movies where "people die in the end." Wyler eventually convinced Goldwyn to buy Wuthering Heights as a vehicle for his new star, Merle Oberon. 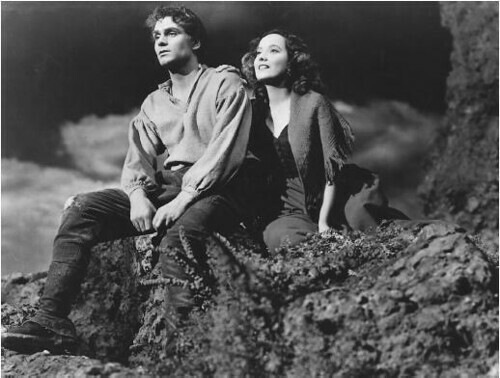 Cathy Earnshaw (Merle Oberon) and Heathcliff (Laurence Olivier) contemplate the moors in Wuthering Heights. Best Performance: Laurence Olivier as Heathcliff. Flora Robson as Ellen the housekeeper certainly deserves an honorable mention, but Olivier probably gives his best screen performance as the Gypsy orphan who vows revenge on all those who have scorned him. Olivier had a difficult time making the film. He wanted his great love Vivien Leigh to be his co-star, and his extensive stage experience sometimes caused him to overact. Olivier frequently clashed with Oberon and Wyler, but he later credited his experiences on Wuthering Heights with teaching him how to act on screen. Best scene: Cathy explains to Ellen why she can't marry Heathcliff. This scene features Gregg Toland's best cinematography on Wuthering Heights. (clip below). Best Line: "I cannot live without my life! I cannot die without my soul!" Heathcliff. 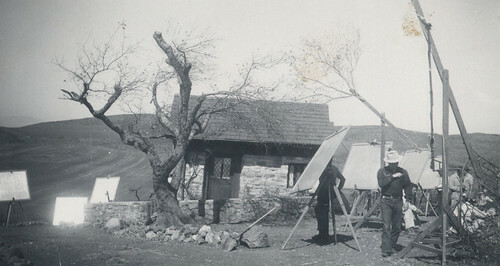 On-set tension: The set of Wuthering Heights was filled with tension. There were many behind the scenes shouting matches, according to both Olivier and Niven, who wrote about their experiences in their respective autobiographies. Oberon and Olivier couldn't stand each other, and during one particularly intense love scene Olivier accidentally spit on her. She complained to Wyler, which caused a shouting match between the co-stars. Olivier reportedly screamed at Oberon, "What's a little spit between actors?" Wuthering Heights was partially filmed in the Conejo Valley in California. Here's a behind the scenes shot courtesy of Conejo Through the Lens, Thousand Oaks Library. Location shooting: Wuthering Heights was filmed in Southern California's Conejo Valley, and Goldwyn went to great lengths to recreate the Yorkshire moors on the rolling hills and pastures where they made the movie. Goldwyn sent a film crew to England to bring back 1,000 heather plants. The crew then stripped 500 acres of vegetation and placed the real heather with 15,000 tumbleweeds that were spray painted purple. Fun Fact: Niven had some trouble crying for a particular scene, so Wyler gave him a menthol mist substance that was supposed to help him work up some tears. Niven had an allergic reaction to the substance, and instead of tears, a green goo came out of his nose. 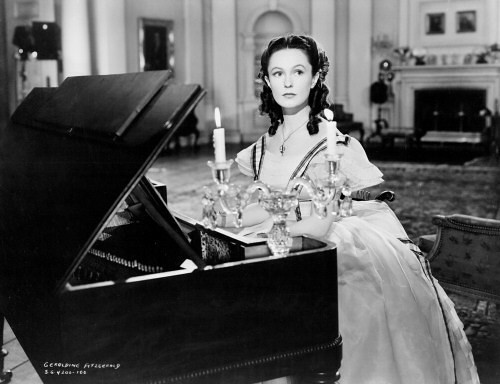 Geraldine Fitzgerald as Isabella Linton in Wuthering Heights. Why it's essential: Wuthering Heights is one of the greatest of old Hollywood's romantic films and it is probably the best adaptation of Bronte's classic novel. All four leads give superb performances, especially Niven and Olivier, and the on-set bickering probably helped the actors play a story filled with passion and betrayal. The single best element in Wuthering Heights is Toland's cinematography. Wuthering Heights is a dark story and it actually benefits from being filmed in black and white; even so Toland puts on a masterclass of lighting techniques, especially in the thunderstorm sequence. Availability: Wuthering Heights is available on DVD and video on demand. The essentials will be off next week. Instead, we'll be participating in the Classic Movie Blog Association's Spring Blogathon with a feature on Maytime (1937), starring Jeanette MacDonald and Nelson Eddy.